The Federal Republic of Germany’s secret service is older than the Federal Republic of Germany itself. It was set up, under US supervision, in 1946 as “Organisation Gehlen” and consisted largely of former top-ranking National Socialists. In 1956 it was re-named “Bundesnachrichtendienst” (BND). In addition to central offices in Munich-Pullach and Berlin, the BND runs about 200 secret branches worldwide, half of them in Germany. The Academy Book Shop on Türkenstrasse in Munich did not sell books. It was a branch of Organisation Gehlen. The proximity of the secret-service’s bogus company to the Art Academy, and the distance of the Art Academy at the time from theory ensured that the code name Akademie Buchhandlung was difficult to decipher. With his series Secret Sites, Franz Wanner presents past and present secret-service sites. For Public Art Munich, he has staged the narrative of his engagement as a situational loop. In the framework of the X-Shared Spaces of Munich’s Kammerspiele, and under the heading "Die Befragung" (The Interrogation), he treats the state secret and the private sphere as dispositifs of contemporary reality production. Franz uses artistic means to examine local reality in a global context. In doing so he focuses on covert structures in superficially-transparent states of affairs and put apparently lost historical information in contemporary contexts. His installations were shown in the Museum of Contemporary Art, Shanghai, the Museum of Moscow and the Städtische Galerie im Lenbachhaus, München, et al.. He has been working under the pseudonym Franz Wanner since 2000. 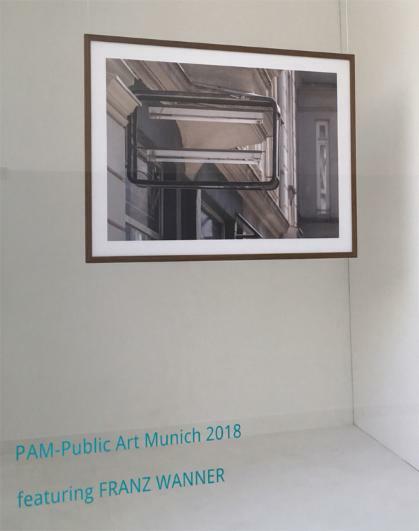 Performative artistic commissions in public spaces in Munich. April 30 – July 27, 2018.